Amazone’s new Distance Control Plus boom guidance system utilises new technology with four sensors that are mounted to a crop sprayer boom. Amazone’s Distance Control Plus boom guidance system is designed to automatically maintain the optimum distance between the nozzle and the target surface. 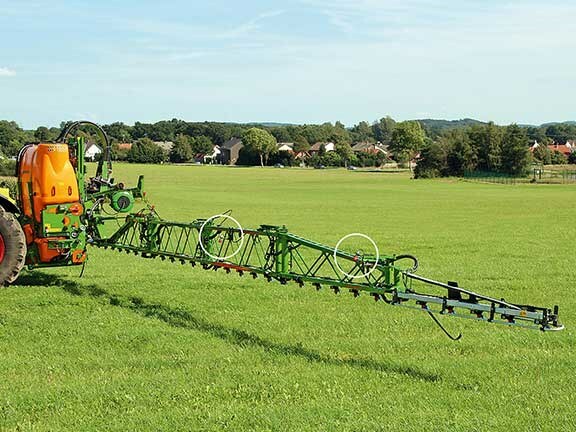 Amazone product manager Craig Hopkins believes the new technology is ideal for today’s spraying requirements. "Producers and contractors want to travel faster and to reduce the target distance above crop to less than 50cm," Hopkins says. "The boom guidance system is particularly useful in hilly ground or inconsistent crop conditions." The Distance Control Plus system consists of four sensors that are designed to be mounted along the length of the boom. Having four sensors, rather than the typical two, is much more effective according to Hopkins. "Having one sensor on each boom half may not provide sufficient accuracy under difficult conditions, such as differing crop heights found in patchy or lodged crops, which could cause the boom to dip into the crop," he says. "The fitting of additional sensors allows a much larger surface of the crop to be scanned. Claas Harvest Centre is the Australasian distributor for Amazone boom guidance systems. If you're looking for sprayers for sale, check out our listings.